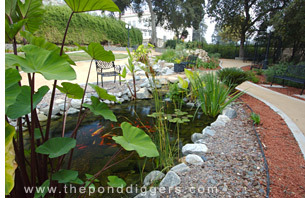 Get a FREE Pond Design Guide via Email! Pond supplies and Pond Construction is what we live and breathe. 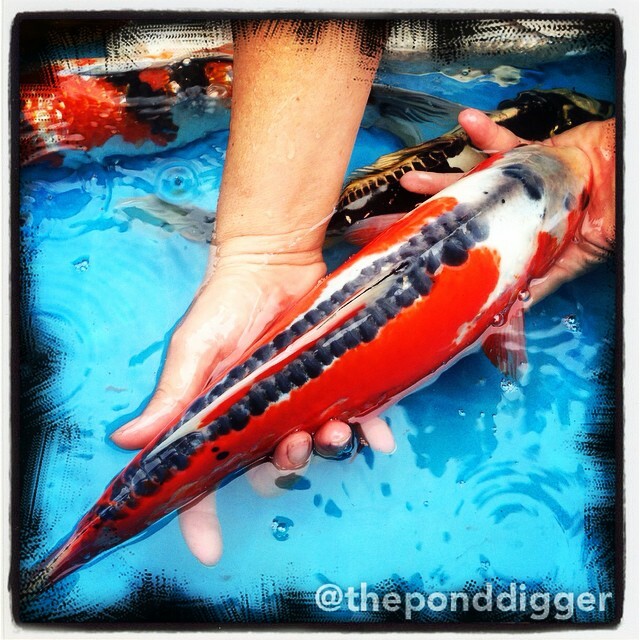 The Pond Digger Inc is not only supplying pond care products but also koi pond supplies to homeowners and professional pond contractors across the nation. 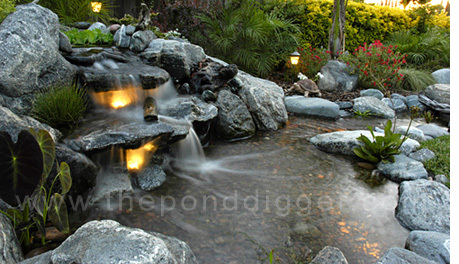 We are a nationally recognized construction company specializing in Pondless Waterfall Supplies and Koi Pond supplies. We are stocked to the ceiling with your pond supply needs for maintaining and constructing a wide variety of water features. The Pond Digger headquarters is based in sunny Southern California, in the City of Yucaipa halfway between Los Angeles and Palm Springs. Our showroom is open to the public 6 days a week for walk-ins and customer support. Our showroom hours are Monday through Saturday from 9am to 5pm. We offer professional design assistance, training seminars, and technical support. We have many display ponds, waterfalls, aquatic plants and demonstrations at our facility to educate and inspire. We encourage you to stop by talk, learn and shop for your pond supplies. We have a large inventory of pond supplies and construction supply equipment for building koi ponds and accessories for the care and maintenance of water features. We are heavily stocked with the latest and greatest innovative pond supply equipment and customize pond kits for any design you can dream. We deliver hundreds of different supplies through our online store with quick and efficient shipping throughout the United States. With Information, Education and Inspiration as our foundation, it is our goal is to assist you in creating your own one of a kind water feature. We want the opportunity to teach you how to build your dream waterscape right the first time or have the opportunity to design and build it for you. Before you let a contractor on your property educate yourself by reading our Pond Contractor Warning Report. We guarantee this will save you time, headache and a ton of money. This report could keep you from being showcased on our Ponds Gone Wrong page. The Koi Pond Meets the Water Garden! It’s a fusion of water gardening and Koi pond construction philosophies. Advances in the water garden industry, like Helix Life Support filtration systems, have renowned Koi Experts looking at the water garden industry with a new perspective. The fact that pond owners, in general, want the best of both worlds, can no longer be ignored. Most of your basic water gardens are not designed to maintain optimal Koi health and traditional Koi ponds are not designed to blend into the landscape naturally; all the while Koi can and do thrive in both pond construction types if certain technologies and maintenance routines are set in place. The development of a hybrid style koi pond has developed from the public’s desire to have the best of both worlds. The hybrid style pond is a combination or a fusion of the two pond construction philosophies. 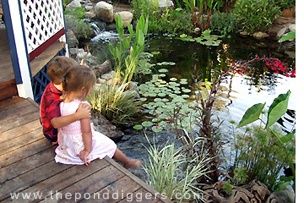 The Pond Digger Waterscape Design & Construction Company has literally interviewed thousands of pond owners and prospective pond buyers to reveal consumer desires. Homeowners want a pond that blends seamlessly into the landscape while offering pristine water quality and a healthy environment for koi fish. Education & information covering both pond installation and pond maintenance is the backbone of our strategy in designing a system for our clients. Our Design Consultation Team is second to none. We offer a service where we come to you as a pond design consultant looking out for your best interest in the early planning stages of pond construction. Additionally, we offer Pond Inspections for existing problem ponds that need troubleshooting. By embracing water garden construction philosophies and incorporating dedicated koi filtration technologies including aeration systems, UV Sterilizers and the collection of bottom debris via Bottom Drains, we can find a neutral ground in the middle of this amazing hobby where the water garden meets the Koi pond. Pondless? Now, for those of you who want a waterfall but aren’t so sure about a fish pond or worried about young children around a pond, there’s always the pondless waterfall or rock column fountain feature. These special pondless systems include the sound of a waterfall, rocks, gravel, and aquatic plants that you would normally have in a pond, but no fish and more important no water deeper than an inch or two! That’s why it is called pondless! Pondless water feature systems are perfect for schools, businesses and those who want a front yard water feature, travel frequently, have young children or limited space. It’s called a disappearing pondless waterfall because the water does not form a pond but instead disappears into an underground pondless reservoir beneath rock and gravel. The water is pumped to the waterfall, or rock fountain, and disappears into the pondless basin, which contains the pump chamber and pump. These water features can also have a stream incorporated into the design for added interest. The modular equipment in the pondless waterfall basin beneath the rocks and gravel is strong enough for more than ten adults to stand on. The Pond Digger has hosted more than two dozen Ponds For Schools programs across Riverside and San Bernardino counties. These Ponds For Schools programs became mainstream when the liability-free disappearing pondless waterfall hit the scene. When was the last time you saw your reflection in a pond? Imagine your everyday lifestyle enhanced with the vibrant colors of koi fish and the soothing pond design that will turn your landscape at your home or workplace into a tranquil environment. Our pond construction crew known as The Pond Digger is based in Yucaipa, California and we service the entire Southern California basin including, San Bernardino, Riverside, Los Angeles, Orange County, Santa Barbara, Ventura and San Diego Counties. The Pond Digger is recognized nationwide as one of the country’s top waterscape contractors. The Pond Digger Inc tackles small pondless water feature projects or large lake construction projects with the same professional approach. The Pond Digger Inc is a specialized “waterscape contractor”, installing top quality customized pond kits designed to fit the needs of our clients. Whether you are looking to build a one-acre lake or a small backyard pond project, we want the opportunity to serve you. We offer on-site Pond Design Consultations at your home or business for a nominal fee that will be applied to your contract price should you decide to use our organization. Free estimates are gladly given over the phone upon request for professional installations or do-it-yourself pond kits. An on-site Pond Design Consultation is a great investment of your time and money. A professional from our team will spend as much time as you need to walk you through the design process, giving you the insight from hundreds of professionally constructed koi ponds and the popular pondless waterfall systems. At the time of your design consultation, nine times out of ten, we will be prepared to give you firm pricing for your project, review available construction dates and if you are ready, sign a contract on the spot for your future waterscape. What are you waiting for? You could start your mornings by looking out your window and seeing cascading waterfalls, flowing streams, then end your day with the relaxing sounds of your waterfall illuminated by underwater lighting. Remember if you live here in Southern California, we build ecologically friendly, Low Maintenance Waterscapes for aquatic plants & fish, but more importantly for people, and we want your business. We work hard to gain your business and we work harder to maintain your business. The Pond Digger is licensed by the California State Contractors Board and we maintain full coverage General Liability and Workman’s Compensation Insurance. You can be confident that The Pond Digger provides the highest level of customer service available in the industry.